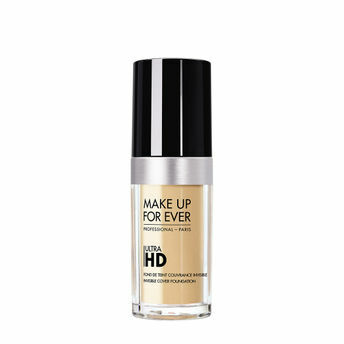 Developed specifically for the film and TV industry's most advanced technology, Make Up For Ever Ultra HD Liquid Foundation creates a naturally flawless complexion-on and off camera. Completely invisible under the latest, super-focused 4k lens, this revolutionary foundation features uniquely-coated pigments that provide medium to buildable coverage with an even lighter weight, second-skin texture that looks just like skin. This lighter weight formula delivers the very same flawless results as before when applied with a flat foundation brush in a tap and stretch motion. Long lasting with a natural finish, Ultra HD Liquid Foundation is formulated with hyaluronic spheres to ensure comfortable wear on all skin types. Ultra HD is the perfect everyday foundation for a flawless complexion - and an unretouched life. Explore the entire range of Foundation available on Nykaa. Shop more MAKE UP FOR EVER products here.You can browse through the complete world of MAKE UP FOR EVER Foundation .Alternatively, you can also find many more products from the MAKE UP FOR EVER Ultra HD Liquid Foundation range.